Last week we helped our kids move into their new house in Buford, Georgia. Moving is a chore we are familiar with. Brian and I moved ten times during the first 17 years of our marriage. Half of those times a moving company took care of the packing, loading, transporting and unloading, but we always chose to unpack ourselves. That meant a lot of paper! Seas of paper! It’s the only way to make sure nothing gets broken, and moving companies don’t want anything to break. When Dan and Bob were small, like Jake and Matty, I made a game out of the unpacking. I’d pull a paper bundle out of a box, and we’d try to guess what was wrapped up. 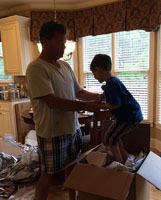 When a package the size of a basketball turned out to be a cereal bowl or mug, the boys quickly lost interest in the game. 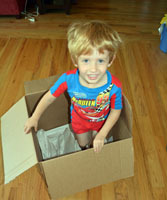 Playing in the boxes was way more fun. I always enjoyed the unpacking. Seeing all our familiar things quickly made the new house feel like home. It was good to unpack a gift someone had given or a serving dish we used on special occasions. As I would look for just the right place to store or display the item or picture, I’d enjoy the memories that came with it. I think that’s one of the reasons we enjoy Bible study; as we study God’s Word we get to unpack our hearts. We are reminded of all the good things that we have stored away. Sometimes we pack away the not-so-enjoyable events of our lives and hope they stay hidden forever. 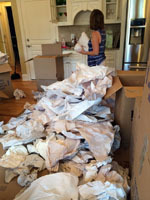 We’ve wrapped them up in more paper than a moving company wraps crystal and shoved the packing box securely into the furthest corner of our hearts hoping we can forget what is there. God doesn’t. God sees everything. God knows everything. God knows if what you have packed away needs to be left in storage or if it needs to be unpacked. In the summer, if you take a spiritual break, it’s easy to forget about your heart and the unpacking slows or stops completely. My challenge to you: If God is bringing something to mind that needs to be unpacked from your heart — then unpack it. He already knows it’s there. You know it’s there. Just unpack it. Peel off every bit of paper, and bring it into God’s forgiving, cleansing and healing light. What would God have you unpack today? Once you’ve unpacked whatever it is, then throw the paper away, crush the box, and use whatever you’ve unpacked to make God famous. Don’t be afraid to use what you’ve unpacked. Could sharing what you’ve unpacked prevent someone else from experiencing the same not-so-enjoyable thing? Could it help someone who is walking a similar path? Could telling another person how God helped you spur them to unpack?